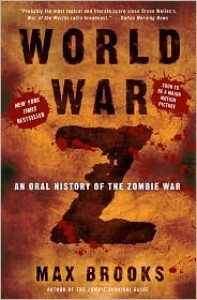 This was my second go-round with World War Z by Max Brooks, and it didn't take long for me to remember why I gave up on it the first time around. I enjoyed the epistolary style and it certainly had a few moments where the content of the individual interviews was interesting, but overall I thought it lacked plot and was boring. Maybe, unlike their undead counterpart, the vampire, zombies simply don't translate well to paper and are better suited for the screen?